Editor’s Note: In this story, St. Patrick parishioner Ronnie Muro talks about a simple handshake that became memorable -- because of the man behind it. We hope you enjoy this “Story with a Purpose”. It is said that the custom of shaking hands goes back thousands of years. It was originally a way for someone to make sure the other person was not concealing a weapon in their hand. It has certainly come a long way since then, as the hand shake is used in many ways in today’s society. You shake hands with a friend when you see them. Or, you shake a stranger’s hand when you meet them for the first time. A hand shake can be used for ‘hello’ or ‘good bye’. 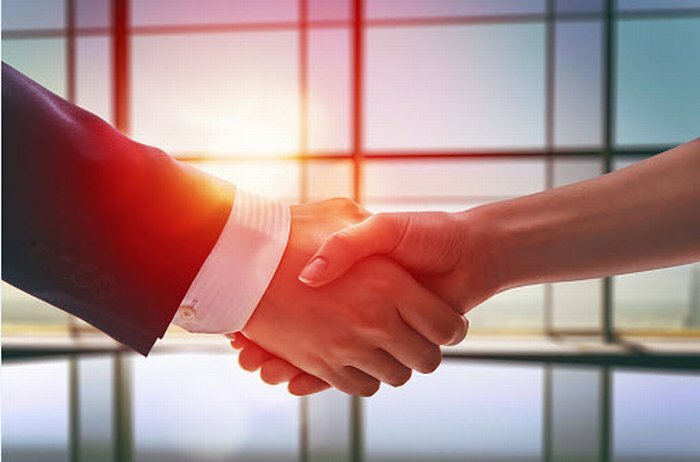 Shaking hands in business seals a deal. In church, we shake hands as a ‘sign of peace’. As a child, I thought shaking hands was something that adults did. You didn’t see many handshakes on the playground. One of my most memorable handshakes was when I was a kid. I got into an Alabama football practice at Legion Field and the legendary coach, Bear Bryant, was there. As he was leaving the field, dozens of kids lined up along the fence with our hands outstretched, just wanting to shake hands with the Bear. He reached out and grabbed my hand and I was thrilled, vowing to never wash it again. Thankfully for the many I have come into contact with over the years, I did wash that hand. But the memory still lingers. Shaking a famous or prominent person’s hand is something I still get a kick out of. Recently, I shook Nick Saban’s hand and that little kid inside me was still as thrilled as the kid at Legion Field many years ago. Over the years, I suppose there have been other prominent people that I’ve shared a handshake with. Some were famous; others not so much, but still important to me. But of all those handshakes over the years, one still stands out to me. It wasn’t a celebrity or a sports figure and it didn’t happen in public. It was a simple handshake that happened in church. In recent years, I started attending Saturday night Mass more often than on Sunday. It’s a little different on Saturday, definitely leaning to a bit of an older crowd. Typically, the same familiar faces are there. Some I have seen through the years at St. Patrick and some I don’t know all that well. One gentleman that usually attended on Saturday night was someone that, over the years, I had grown to admire. I often thought of him and wished I knew him better, knew more about his life. We talked only in passing but it always left me feeling good. His name was Henderson Burgess. “How’s it going young man?” He would greet me with a smile as we met in the back of church before or after Mass. “Young man” - that always struck me. I suppose I was a young man when we first met (at least to him), as I was in my 40’s. But now I was past 60, no longer a young man, and he greeted me the same way. I loved it. Mr. Burgess was also fond of saying “If I’d known I was going to live this long, I’d have taken better care of myself!” Really? I thought he was in amazing shape for someone in his 80s and that was another thing I admired about him. One Saturday night as I went up for Communion, my friend Henderson Burgess was seated in a front pew next to the aisle. I just wanted to show him a sign of affection and respect, so I reached out and patted him on the shoulder softly. What happened next caught me off guard. He gave me a big grin and extended his hand in front of his chest. I grabbed his hand and we exchanged a hearty handshake. That is my most memorable handshake. It became a ritual for me at Saturday night Mass. I would look to see if Henderson (Mr. Burgess, I should say) was seated in his customary position. If so, my heart got a little lighter and as I approached the altar, I made sure to tap him on the shoulder and get my handshake. It became something I looked forward to each week. Once I thought I saw him peeking over his shoulder. Was he looking for me? Did he look forward to this as much as I did? Probably not, but it was fun to think so. Once I wondered if the Lord would approve of my little diversion just before receiving the body and blood of Christ. Shouldn’t I be focused on that moment just ahead of me? I feel pretty sure the good Lord was ok with it. For what better way to be welcomed to the Lord’s Supper than by one of his most loyal and dependable servants. Eventually time would take its toll as it does on us all. Mr. Burgess could no longer attend Mass and I missed him every week. After one Saturday night Mass, I dropped him a card that said simply, “I missed my handshake!” I think he understood. I did get one last chance to be at Mass with my friend. He sat in a wheel chair in the back. I had to take my grandson to the rest room and on the way, stopped by and shook the hand I’d missed so much. The effects of his illness were obvious, but obvious still was that spirit I so admired. Then, just for good measure, on my way to Communion I swung by him one more time for the last handshake we would share. My hope is that his memory will live in me not as just a memory, but as an inspiration. Perhaps someday I’ll greet a “young man” at church with the spirit and love that Mr. Burgess showed to me. And of course, that will be followed by a hearty handshake. "I have fought the good fight to the end; I have run the race to the finish; I have kept the faith."